No, we didn’t see a giant reptile rise from the murky waters, but we did see rather a lot of vomit emerging from one of our little monsters. Our youngest gets terribly carsick -- or coach sick, really, because it only seems to happen on long-distance busses. We had thought she might be outgrowing it, so we went ahead and ordered the tickets. Sadly, not. I’m afraid it was a rather terrible trip, and we weren’t able to enjoy the fantastic scenery as we’d all hoped. As for spotting Old Nessie, well the beast could have been jumping clear out of the loch and doing triple back-flips for an hour, and we would have missed it. Now, with a segue as rough as a dry heave, I can point out that I am allergic to cats in a way my youngest is allergic to long bus journeys. 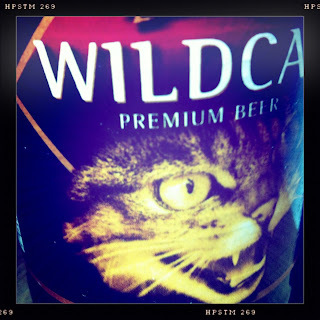 And that brings us to today’s beer, Wildcat from Cairngorm Brewery in Aviemore near Inverness. It pours dark amber, and there’s something almost almost candy-ish -- maybe butterscotch? -- on the nose, which continues into the taste: malty sweet with something else as well... A hint of ginger, perhaps? In any case, it was a pleasant way to unwind in Inverness after a most unpleasant trip.